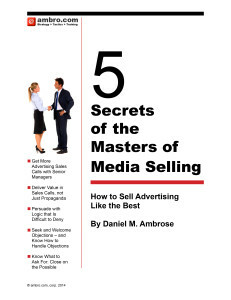 If you sell advertising, you have suffered many indignities while trying to obtain high-level appointments. You’ve likely dodged the slings and arrows from many different kinds of clients and know how hard it is to get to see them. The most frustrating, for many of us, are the lowly media planners and buyers who think of themselves as “decision makers” when in fact they only decide what to recommend to the client. These buyers are so often feted by so many of your competitors that they have started to think of themselves as celebrities. Learning how to break through that game at the highest, or the lowest levels, is what this book is about. The author didn’t intend that. He wrote a book about selling to the “C-suite” executive who is protected by secretaries and minions. But if you treat your clients like CEOs your success will one day put you in the C-suite yourself. The most important lessons here have to do with how you use the time when you do get an appointment. 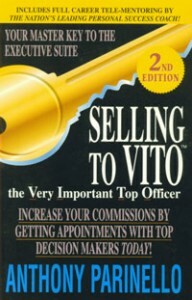 One beauty of this book is that it dovetails wonderfully with the Strategic Sales Tactics approach taught by ambro.com. SST is an updated version of the structured sales approach taught by Ziff-Davis in its hey-day. Both say that the opening of your meeting with a client must show the client that you deserve to be there, because you know a lot about his or her business. In solution selling, it is imperative that you ask a lot of questions. And of course asking the right questions is critical. But before you can start peppering your prospect with questions you must ‘earn the right’ to be there. Your prospect is very busy. To earn the right to their time you must prepare with something you can open the meeting with that shows you understand their market and their problems.